Serving accident victims in and around the Palm Coast region, we at Joe Horrox Law take all sorts of legal claims very seriously. Victims of auto accidents need skilled attorneys to help them with their lawsuits, helping in the fight for just compensation for injuries and losses. In recent years, a number of auto accidents have been linked to drivers using their phones while behind the wheel. We'd like to consider the dangers of texting and phone use while driving right now. How common is cellphone use while driving? According to various sources about driver distraction, the number is higher than it should be. At textinganddrivingsafety.com, it notes that at least 23% of all auto accidents in 2011 involved cellphones in some way. This translates to 1.3 million crashes. Young drivers are often more likely to use cellphones behind the wheel; 13% of drivers 18 to 20 who were involved in accidents admitted that they texted or talked on their phone at the time of the collision; 34% of drivers aged 16 and 17 said they have texted while driving before. Many of the surveyed teens also saw their parents text and drive, the website found. Over at distraction.gov, the US Government's official website regarding distracted driving, it's estimated that 660,000 drivers across the country are using their cellphones behind the wheel during daylight hours at any given time. 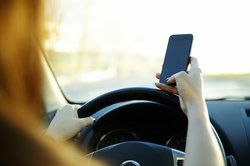 When you are texting, dialing, or even just talking on the phone, you are diverting your attention from the road, and potentially taking your eyes off the road in the process. Going back to findings from textinganddrivingsafety.com, a driver who is texting will have his or her eyes on their phone rather than the road for around 5 seconds. For a vehicle traveling at 55 miles per hour, 5 seconds is all it takes to travel the length of an entire football field. Talking on a phone will make an accident 1.3 times more likely; just reaching for the mobile device can make an accident 1.4 times more likely; and dialing someone up can make accidents 2.8 times more likely. With texting behind the wheel, however, an accident is 23 times more likely. Please remember the above facts when it comes to smartphones and driving. Given the dangers posed simply by using a smartphone while behind the wheel, it's just a bad idea to have one out. You should really pay attention to the road instead. While on the road, be sure to avoid using your phone for any reason while the vehicle is in motion. Only answer you phone, check emails, and check texts when you are safely parked and the vehicle is stopped. If you have a hands-free set, you can use that to talk while driving, but you must still remain very careful while behind the wheel. For more information about your legal options following a serious auto accident, it's important that you contact our personal injury law firm today. At Joe Horrox Law, we will help you receive just compensation for serious injuries and the loss of a loved one.